A domestic animal originally bred from wolves. Dogs are considered to be the first animal domesticated by humans. Dogs are the best animal for the purpose of making pets because of their loyal, playful, sporting, and open-minded nature. Even Traders accompany dogs with them so as to guard their things on the journey. Dogs are even helpful in cotton and woollen mills. As some breeds of dogs are good ratters which keep surrounding clean by rats. Dogs eat both Vegetables and meat. A baby dog is called a pup or a puppy. Here is a list of top 10 cutest dog breeds on Earth. A Breed from spitz type of dog i.e. dogs which have long and thick hair generally white in colour. It has got its name Pomeranian from the region in Germany. They have a lifespan of 12 to 16 years and are very small in size. They are classified as toy dogs because of there behaviour towards humans. One of the smallest dog breeds most commonly suffers from a genetic disease which changes the colour of their hair to black and then hair fall occurs. A dog of this breed was owned by Queen Victoria. These dogs think themselves to be very powerful and therefore sometimes attempt to fight with dogs bigger than them in both size and power. The breed has been ranked number one as the world has great demand for small pet dogs. In modern times, the Pomeranians come in almost all types of colour which include white, black, brown, red and spotted brindle. Though they are playful and crazy but are very sensitive also and whenever they see anyone new around their surrounding, they start Barking. Related: Why Dogs and Cats Are Awesome. One of the most popular and cutest dog breeds in the world is an outcome from accidental cross-breeding between Pug and Beagle in the year 1980. It is also called “Designer Dog”. There are no breed clubs for the puggle. A sweet and intelligent dog which can be easily adjustable in any family. They are playful and love spending their time while playing and enjoying. They love socializing, learning new experiences and are very affectionate to children. Since puggle is a people lover pet, it should be kept indoors and should spend time with family members. Hobbies of puggle include howling, barking, Digging, or wandering. They are very loyalist and will always live with you the way you have trained them during their upbringing. Puggles have a lifespan of 10-15 years. They need a healthy dog diet. They generally catch allergies from surrounding so they need a special diet with a prescription. Related: Top 10 Shortest Living Dog Breeds In The World. One of the cutest dog breeds named after the place of its origin in the lake district in England. It is a hypoallergenic puppy with a lifespan of 12-16 years. It weighs 7-8 kg and is 33-38 cm. They are quite silent dogs and barks only when necessary. They have small eyes than other dogs which are quite invisible from its long hair. The breed comes in a variety of colours. The dogs are friendly, very intelligent and free minded. The Lakeland is energized by the terriers playing and enjoying all around the lake. The first Lakeland Terrier was claimed to have been recognized by US Kennel Club in 1921. However, in 1932 the Lakeland Terrier Club was founded and it promoted the breed nationally. The dogs do not shed if they are properly groomed. It is recommended that daily playtimes and exercise are must for the dog so as to keep it energetic. A dog which belongs to the Bichon breed. It is categorized in the non-sporting group of dog breeds in the United States, whereas in the UK it comes under the category of toy dogs. It weighs 7-12 pounds and has a lifespan of 12-20 years. 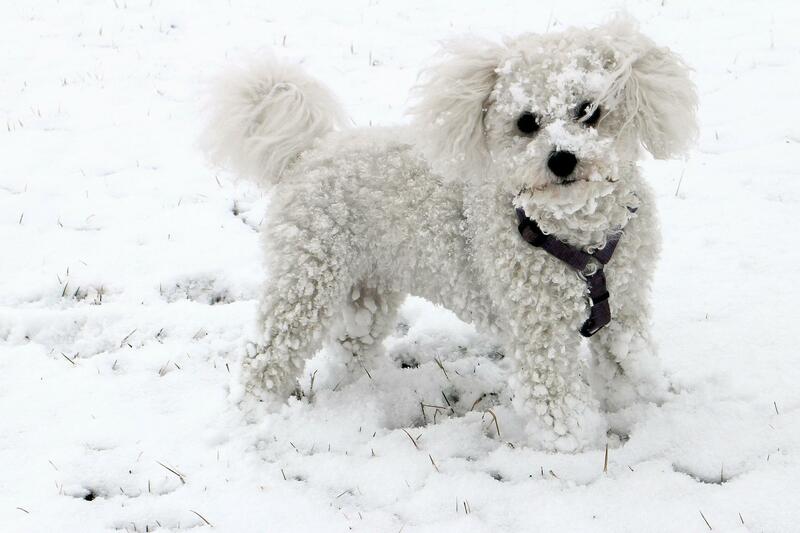 All Bichon are white in colour. No other colour of the breed is available. Bichon breed dogs are originated from Spain but are sometimes depicted as French dog as French consider them to fall under the category of lapdog. In Spain, people use these dogs as sailing dogs. Modern Bichon is categorised into 4 – the Bichon fries, the Maltese, the bolognese and the Havanese. Related: Top 10 Best Guard Dogs For Security. pounds and loves to be around people and can even try to chase small prey. A fighter Breed of dog originating from the US. In 1893 accepted as “ORIGINAL GENTLEMAN” and a non-sporting dog by American kennel club. This dog has a lifesaver of 13-15 years. It is lovely, friendly and intelligent in Nature. A small dog with a compact body and erect ear. Though they are friendly but can be stubborn at times. They are either black in colour or brindle white. Their sensible attitude towards barking makes them apartment dwellers. They love being in a company of children or elder. They even settle well with canine or non-canine pets if properly socialized. It is one of the cutest dog breeds in the world. Also, read about biggest dog breeds in the world. A compact toy sized terrier of no more than 7 pounds originally developed in Yorkshire, England during the 19th century. It has got a lifespan of 13-16 years. The main need of breeding Yorkshire terrier was felt by the cotton and woollen factories. Yorkshire terrier is a ratter which keeps its surrounding clean from Rats. Therefore in Yorkshire, nearly all the woollen and cotton mills have this terrier. They are very loyal to their masters. Besides regular exercise, a daily walk with their master is loved by Yorkshire Terriers. The first Yorkshire terrier was registered by AKC (American Kennel Club) in 1885. The dog is often called the most famous dog in the most cities of America. The dog needs the slow and calm situation to adopt a new environment. The Yorkshire Terrier’s coat is very similar to human hair and needs proper care accordingly. Their long hair on their head needs to be trimmed regularly to avoid eye irritation from hair. Participating in dog sports will keep them healthy and active. Brussels Griffon is known for its intelligence and sensitive nature. It comes n a rough wiry coat and looks like a little terrier. Also, popular as spunkiest cutest dog breeds that takes himself very seriously makes him a keen watchdog. It doesn’t require a lot of outdoor exercises. The average weight of dog breed is 7 to 12 pounds and have bossy, affectionate and active personality. A sturdy, compact and intelligent dog categorised as a toy dog. Pugs were originally bred in China as a lapdog for ruling families. Later in the breed came to Asia and other parts of the world. The breed has received affection and love from ancient times and hence listed as one of the cutest dog breeds in the world. In Tibet, pugs are kept as pets in monasteries by Buddhist monks. Pug has a physically distinct feature i.e. they have wrinkly, short-muzzled face and a curled tail. Pugs are rarely aggressive and are good pets for family and children. Pugs can easily judge the mood of their owner and always try to please them. Pugs are often named as “Shadows” because of they just like shadow always follow their masters and try to draw their attention and affection towards them. A medium-sized muscular strong dog with a wrinkled face and distinctive pushed in nose. According to AKC, Bull Dog is the fourth most popular pure dog breed in the US in 2016. Compared to other dogs they have a less lifespan of 3-10 years. They are courageous and dignified dogs adjustable in families. The dog is named “bull” because the dog was used in the sports of bull baiting. Bulldogs require regular exercise. If they don’t exercise they become overweight leading to heart and lung problems and stress on the joints. Bulldogs are very sensitive to heat. During summers they should be kept in shade and given plenty of water. Bulldogs is popularly used to represent countries like England and is the official mascot of US MARINE CORPS. Thirty-Nine American Universities used Bulldog as their mascot. room to room. He can live up to 10-18 years and weighs approximately 9-16 pounds. The only purpose of Shih Tzu is to love and be loved. He is one of the cutest dog breeds that will definitely make a place in your heart. “le petit papillon,” means “little butterfly.” One of the smartest dog breeds is quite famous as an ancient breed that appeared in paintings by Renaissance giants, Rubens and Titian. The breed is originally from France and classified as a member of the Toy group. Scottish Terrier is popular by the name Scottie has a powerful bark that can scare anyone. The small and fearless dog is known for its independent and playful temperament. The lifespan of a dog breed is around 11-13 years and can grow up to 10-11 inches. Scottish Terrier is best for apartments, however, he is not recommended for homes with young children. These are the most popular and cutest dog breeds in the White House because they stay with three US presidents i.e Roosevelt, Eisenhower and George W. Bush. The Cockapoo is a hybrid breed between the Cocker Spaniel and Poodle. It is popular as one of the affectionate personalities who love to be happy, however, it requires extensive grooming. It comes in all sorts of colours and sizes. Cockapoo is one of the best family dogs famous because of its happy and friendly nature. Sometimes it is also called “big clowns.” They are companion dogs that can live up to 14 to 18 years. Beijing. It is popular as a loyal and intelligent breed, however, it needs proper training to avoid developing negative behaviours. These are the cutest dog breeds in the world. Kindly share your comments.